The talented Taiu of Koigu created these stunning color kits so you can easily knit Andrea Mowry's original designs using KPPPM, Kersti, or Chelsea! Easy peasy! The hard part now? Deciding which project to knit! Please note: these kits contain yarn only patterns are sold separately here or on Ravelry. Contains 15 hanks of Koigu Kersti, 1710 yards total. To fit bust Sizes 46.5, 50.5" (L, XL). Pattern is sold separately. 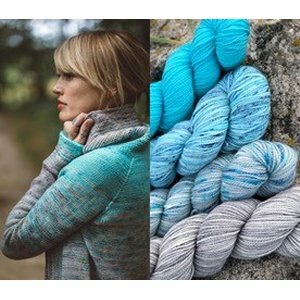 Madelinetosh 2019 Tosh Shawl KAL: Sunshower Shawl Kits and Lorna's Laces Forget Me Not Shawl Kits are both similar kits: intermediate difficulty.